Home beautiful beauty Chin Hair health health news healthy mirror skin worldhealthinfo If You Have A Pesky Chin Hair THIS Is Why It Won’t Stop Growing! If You Have A Pesky Chin Hair THIS Is Why It Won’t Stop Growing! We’ve all been there. You’re looking in the mirror, about to do your makeup… and then you see it. “What on earth is that?” you think to yourself, even though you clearly know what it is. It’s a dreaded chin hair. Yikes. It’s time to get out the old tweezers and deal with this pesky little problem pronto. Well, don’t worry, you’re not alone. In fact, many women find a chin hair now and then. Have you ever been sat there fiddling with your face and tried to pull it out yourself? I’m going to share a disgusting story with you now, but when I tried pulling mine out in public once it just kept on coming, it was like a never ending hair. Not one of my best moments, that’s for sure. Here’s what people had to say about the moment when they found theirs. How did you feel when you first found yours? So if you’re reading this, the chances are that you’ve woken up one day and been startled by the long chin hair that suddenly seems to have sprouted out of nowhere. Nobody likes facial fuzz, and it can also knock a woman’s confidence. The reason is all down to hormones, woo hormones :|! Depending on how sensitive your hair follicles are to these hormones, you may sprout a long one or a short one. Genetics also has a role to play, so chances are if you grandma has a fuzzy chin, then you might do too. 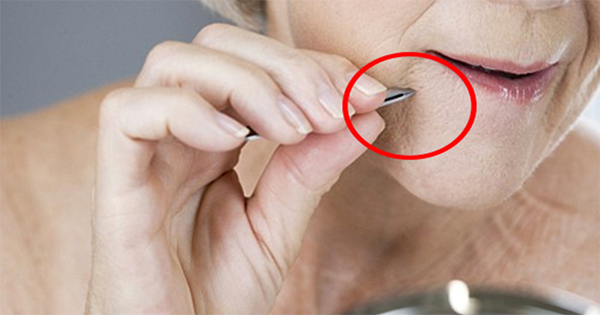 Chin hair can appear at any age, but most women notice it as they get older and their hormone balances shift. Plucking is the speediest way to get rid of chin hair. However, there are also a few other natural remedies that may help too. One or two long hairs on the face is normal but if you notice more, you may want to visit your doctor to check it is not anything serious causing the hair growth. But for the most part, it is nothing to worry about and don’t worry about it ladies, you’re not alone. It’s just that most women probably don’t care to talk about their pesky chin hair.